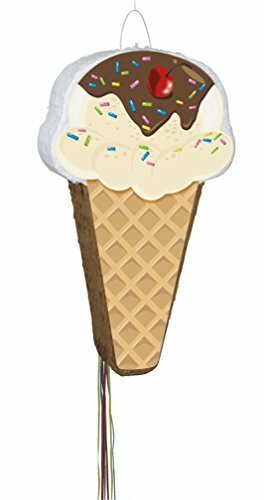 Keep party guests cool with a sweet treat that won’t melt with this Ice Cream Cone Pinata. Perfect for a birthday party, ice cream party, or other summer party, this pinata doubles as a fun party decoration and an exciting party game that kids and adults will love. Take turns pulling the strings until someone tugs on the one that releases the candy and party favors stuffed inside. Don’t forget to load up on sweet treats and small toys to fill this party pinata.